In this post, we’re going to discuss how you can configure the libvirt daemon to use TLS and SASL so that remote connections are encrypted. Please ensure that you have the appropriate packages for libvirt and gnutls installed before proceeding. certtool is part of the gnutls-bin package in Debian. We’ve just created a CA certificate and signing key, a certificate and key for the libvirt server, and a client certificate/key pair for a client (e.g. a laptop). # ones that can offer session encryption as well as authentication. # instead need KRB5_KTNAME env var. Enter your [email protected], for me this is “[email protected]”, and your user password in the credentials window that appears. If you get an error when trying to connect to the remote host then I suggest reviewing the syslog and auth log on the remote host. Googling the python error from virt-manager can also help to determine what the issue is. If you connected successfully to the libvirt host then you are now communicating with the libvirt daemon over a secure connection. Not every interaction with your guests is encrypted with this configuration. The guest console is still unencrypted. If you are concerned about people eavesdropping on the console session you can restrict access by interface in the guest definition file, or configure TLS for the guest’s spice server, but I won’t cover those right now. This entry was posted in Linux, Networking, Security and tagged authentication, certificates, libvirt, libvirtd, sasl on 2014/10/28 by Hal Martin. Following my success in configuring Jenkins to authenticate against FreeIPA LDAP I thought I would also integrate LDAP into Mediawiki. The above configuration uses direct binds to authenticate users, and anonymous binds to verify that the user is part of the specified wgLDAPRequiredGroups. There are instructions for how to authenticate a user against Active Directory using only anonymous binds but I wasn’t able to get this working against the FreeIPA LDAP implementation. Additionally, I found that you need to set $wgLDAPGroupUseFullDN = array('watchmysys.com' => true); for group memberships to be found. Otherwise the LDAP Authentication extension will fail to find the mediawiki group and verify that the username is a member, thus refusing to authenticate the user. 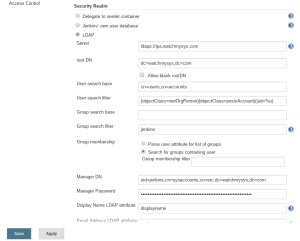 The log file defined in wgDebugLogGroups will contain information from the LdapAuthentication extension and will help you diagnose why authentication is failing. Note: If a user’s Mediawiki username is the same as their LDAP username Mediawiki will remove their password from the database. I’m guessing this means that if the LDAP server is down authentication will not fall back to the user password stored in the database (since it’s now absent). That’s it. You should have LDAP authentication working for Mediawiki. If you run into any problems I suggest enabling wgLDAPDebug and wgDebugLogGroups and examining the logs to find out what went wrong. As always, tcpdump is your friend! This entry was posted in Linux, Security and tagged authentication, freeipa, ldap, mediawiki on 2014/09/25 by Hal Martin. I run a Jenkins server to build projects like the Arietta G25 Kernel and Banana Pi Kernel. I also run a FreeIPA server for central authentication and user rights management. I’m not an expert on LDAP and Kerberos, which is why I like FreeIPA because it allows me to manage these without requiring that I be an LDAP or Kerberos demigod. So, here’s how to configure Jenkins to authenticate against FreeIPA. You will need to install the Jenkins LDAP plugin before proceeding. On the FreeIPA server create an LDIF file to define an unprivileged user to read the LDAP tree. The FreeIPA LDAP server does not appear to support anonymous binds. I recommend the makepasswd program to generate the user password. 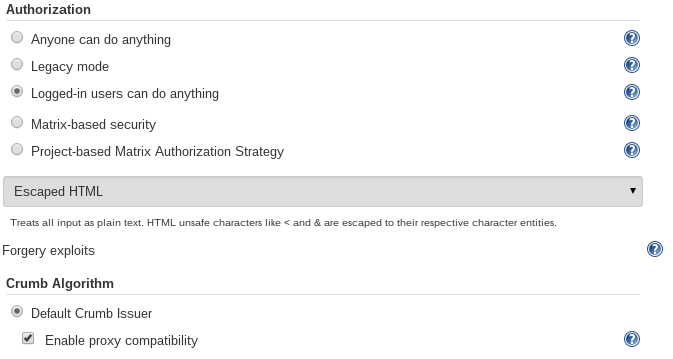 You may want to choose ldap:// instead of ldaps:// during your testing. 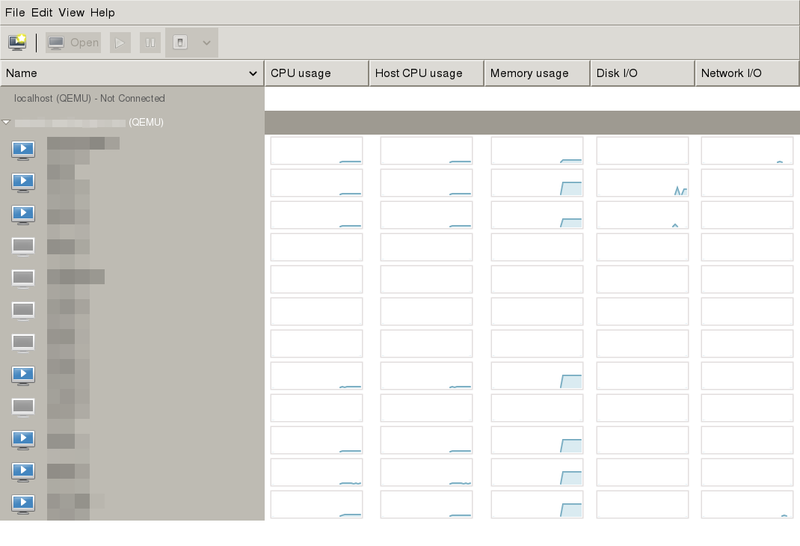 I found it useful to run tcpdump between my Jenkins server and IPA server to diagnose authentication failures. I decided that all Jenkins users should be allowed to administer once logged in. You may decide to implement a more complex security system with different privilege levels. If you cannot login to Jenkins using your LDAP username and password then remove the above lines from your config.xml and restart Jenkins. Jenkins will revert back to the default policy of anonymous users are admins. If your user is not in the Jenkins role on the FreeIPA server you will not be able to login. 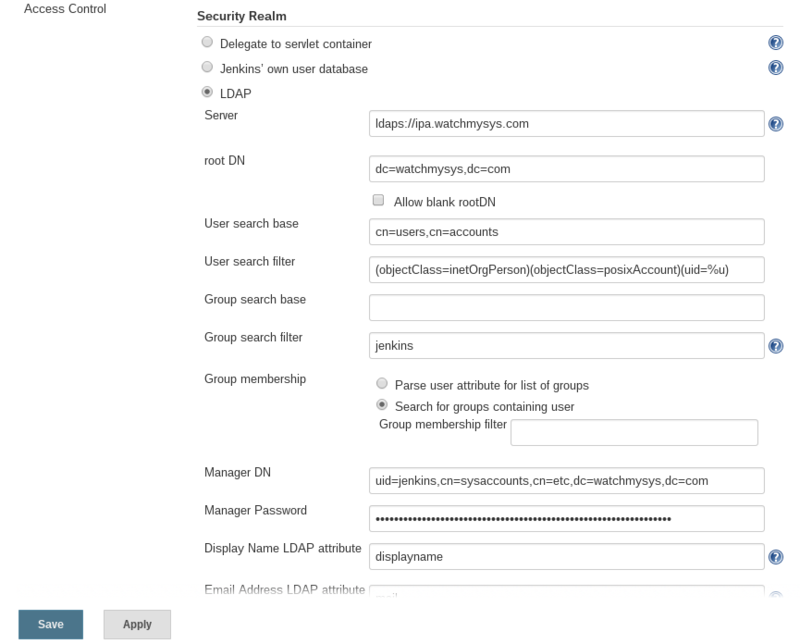 You should now have LDAP-based authentication working in Jenkins. You now have all the benefits of central user management in Jenkins, enjoy! This entry was posted in Linux, Security and tagged authentication, freeipa, jenkins, ldap on 2014/09/08 by Hal Martin.